Earlier this year, the my Arabian mare suddenly passed on. On Friday, just before the last weekend of January 2007, Pentessah (Tessie) colicked during what passes as a cold snap around here. This sort of colic in horses seems to be a seasonal one, often lethal and I have learned that several acquaintances had such a loss this year. Bad year for our horses! All were otherwise healthy horses and the deaths were sudden. Tess had plenty of water but due to the chill and her light-duty life of happily grazing and enjoying the sunshine, there was no working up a sweat. So for a critical period of time as the cold moved in, she never got thirsty enough to guzzle sufficient water for her internal hayburner metabolism (she was not on grain, just grass and hay). 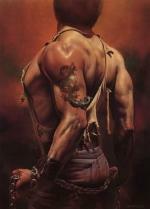 So it seemed sudden to us... Friday, she was rolling and kicking in agonizing pain. She had bed herself down in her favorite snoozing area of her open box. We got her up and walking which is first aid for horse colic. She was cooperative but never really focused on us. She did accept a small piece of hard Holiday candy from me at one point but wouldn't take any more. She became increasingly remote. We got the vet out to see and tubate her as soon as we could. He thought she might have a chance. There was no evidence of sand colic but he found that her packed cell volume was too high. She was seriously dehydrated and wouldn't drink. So he tubed and gave IVs and handed us some Banamine for her. We did what we could do but we were too late, hours passed and we lost her. It all happened in about 24 hours. Such a shock. She was only twenty years old and had never been sick other than a case of strangles as a yearling. That is twenty years that she was a part of my life, representing a good chunk of happy times and many other changes. 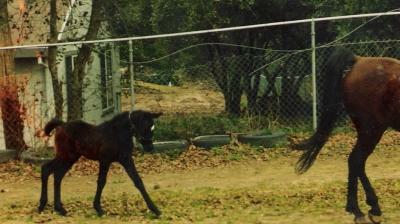 A foal from my first Arabian mare, she was symbolic of several childhood dreams come true. In those sad weeks that followed, the weight of her loss was a terrible toll for me. I discovered that I was not only grieving for her but many more things -- I came to realize she was an icon of a special era in my life. It is still taking time. I found it very difficult to write about. Here's a pic of her as a baby. 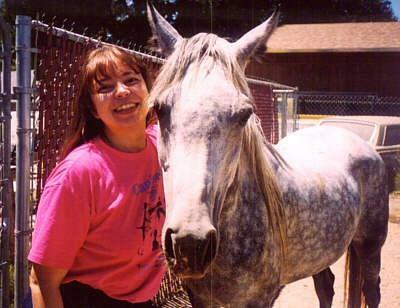 She was born at a small boarding stable owned by a wonderful retired cowboy who also had filled his past with beautiful working Arabian Horses. Blue Book, he was excited to tell me, sharing what he could about my mare's bloodline. I didn't have my own horse property then and boarding was fine -- but after little Tessie was born, before the year was up, we had moved to our current place, and in almost no time, Tessie was playing on our property with her mother, Saleeb. Isn't she cute? That's her mom walking out of the picture. The photo above is a little damaged with glowing pinkish color on the left. This pic is still one of my favorites of her. I kept it in my office at the lab for years and I think a bit of hand lotion or soap got leaked on to it. 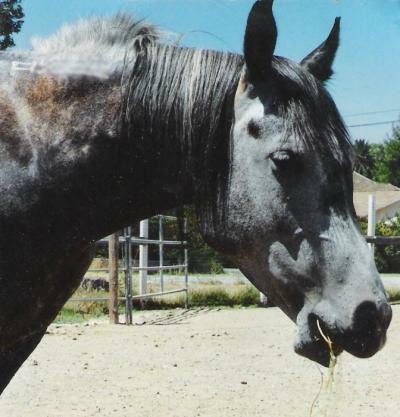 A pic of Pentessah at about 6 years when she was a steel gray. Life was pretty busy crazy due to the work schedule I had back then and I didn't get to ride her or her mother very often. She was such a mischievous horse! She came when called. Loved to cuddle and mooch for scritches and treats. Always gentle. Fireworks, backfires, tarps and plastic (or paper) bags blowing around didn't faze her. She followed me around when I did chores in the paddock and corral. Mischievous? A self inspired pet trick she liked to do... She'd sometimes go to the wheelbarrow and rock it back and forth with her teeth while I pitched muck into it. She had quite the sense of humor... cos if I were in a hurry and ignored her or didn't react fast enough and yell at her (she WANTED to get a rise out of me), she would wait til the wheelbarrow was about full, then deliberately tip the wheelbarrow over and dash off... with her mane flying out behind her and tail arched over her back. She was an equal opportunity brat, cos she'd do the same thing to James. She had a sweet friendly greeting nicker. The word 'cookie' got her attention as much as that of any of the dogs. :) She yelled when her supper or breakfast was late (it always was, in her opinion). And she'd kick up her heels and toss her tail over her back and charge around spiritedly, encouraging who ever was feeding her to be quick about it and get the hay into the feeder! In the last ten years we had her, I had gone completely deaf (idiopathic). She would nicker, and I could 'feel' her greeting. Her nostrils would flutter and the sound would come to my memory. I'd be beaming and calling her name. We'd greet and exchange slow breaths with each other, me blowing at her nostrils and she blowing back. If I were in the paddock, I could give her some chest, belly, ear, neck and head scritches. She'd wiggle her lips happily, with her eyes half closed, head down and ears relaxed and her lower lip drooping... Bliss! A beautiful requiem for a remarkable animal. Thank you for sharing her with us. What a beautiful little lady. 20 years is far too short a time. Such beautiful memories of a beautiful horse. No more denials, no more hemming and hawing by the FDA. Time to take massive cautionary action is now. It’s not just animal feed anymore. It’s not just pet food. It’s a crisis. It’s been going on for years. 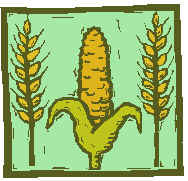 It’s being done in “wheat, corn, soybean or other proteins”. I'm not surprised that it happens. Cutting corners for profit is not uncommon. Remember the hairy, carcinogenic soy sauce that Japan (the USA as well) had also unknowingly let into the country. "It's not the hair that causes cancer," the soy sauce business insider says, adding that it's possibly caused by MCP, a fluid in the body associated with the breakdown of proteins and increasingly accused of having a potential link to the disease. That's not to say some of the controversial sauce hasn't already been imported. "We confirm ingredients and production methods at 31 inspection points at sea or airports throughout the country and have not had a single report of that nature since the start of this year," a spokesman for the Ministry of Health, Labor and Welfare says. "Perhaps this product was never imported." Yet, most food inspections at customs are little more than a cursory glance at documents, keeping alive the possibility that some of the human hair sauce may have slipped through. "It's just not realistic to examine all the soy sauce imported from China," a ministry spokesman tells Asahi Geino. "There's no way we could even possibly do it." What will be the Future of Dogs? A wave of increasing awareness of Anti-animal legislation is coming to the fore. Especially in the past, but to a lesser degree now, people have thought that some of these us versus them Animal Rights issues are alarmist, paranoid, or maybe a bit silly. Some still do. A major wake-up call is underfoot. 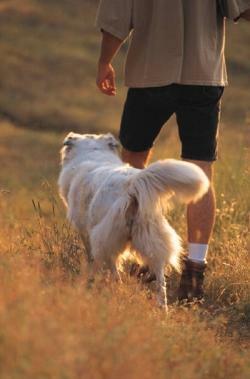 The Future of Dogs is a well written booklet by Walt Hutchens. It is available for reading online. EDIT: From the site: "You are welcome to use it in any way it might help you in the fight to maintain our right to own animals. All we ask is that it be properly accredited to Walt Hutchens, Timbreblue Whippets, Virginia, and that you do not change any of the content." I just contacted him and tweaked this section. Walt says, "[...] the printed booklet is for sale to anyone for any purpose -- not just educational use. It's conceivable that a club could sell them at shows as a fund raiser." This is a great booklet to provide to new puppy owners, friends and relatives to help spread awareness of what is happening at the legislative front and why it is happening in the first place. I quote a little from the materials here, but encourage everyone concerned to go read and/or go to this link to purchase hardcopies for distribution, to help spread awareness of what is happening. Most people are not into Animal Rights at 100%, they are not extreme. The AR movement depends on the non extremists to do most of their work. [AR breaks down their goals] into small chunks that sound good and sell them one chunk at a time to good-hearted, often busy, people. But the chunks are put together to make something that none of us would ever have approved. "People need homes. Please donate to buy a brick." Then they use the bricks to build a prison. It is those people -- the ones who are deeply committed to their own small parts of animal rights -- who are the foot soldiers, carrying the movement forward. Fewer than a thousand run the AR corporations, make the plans, draft the laws, organize the conferences, deliver the speeches, and do the on-the-floor lobbying. Tens of thousands back laws in narrow areas: animal rescuers may support anti-tethering laws to stop irresponsible owners', misguided home breeders back anything labeled as fighting puppy mills,' and animal shelters support close regulation of pet breeders and rescuers. If you tell them "This law did not work in San Mateo County" -- they say "This law was a big success in San Mateo." If you answer "But the shelter euthanasia numbers went up, and licensing went down in San Mateo," -- they say "This law was a big success in San Mateo." Surprisingly, when the subject is unfamiliar, the bigger the lie, the more likely people are to believe it. This 'big lie' tactic isn't often encountered by lawmakers and since doing independent research is time-consuming, they often end by accepting the lies. 4. Since the new laws never solve the 'problem,' the ARs seek greater punishments and still more laws to help enforce the old ones, such as a requirement for all pets to be microchipped with the numbers in a government database. They talk only of the good effects . "This will help more lost pets get home" -- although the real purpose is to catch people who are violating their other laws. 5. As one law begins to spread, a new 'problem' is identified and the next step begins -- go back to #1, above. You've outlined the problems very well. Thanks for the Hutchens link. Common sense seems to be so very uncommon today when lawmakers seem to pass anything that sounds good in a three sentence press release. 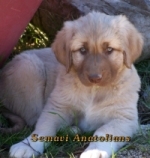 Free Anatolian Puppy Jigsaw Puzzles With a Side of Shrimp! In short bursts, I've had a little fun with a jigsaw puzzle program that Josephine MorningStar shared with me several months ago. She made several (numbers of pieces) versions of a puzzle based on Coco's photo. She has a website which has some of her art available here. Gift puzzles are stand alone versions that don't have all the features of the full game but are still lots of fun. The full featured game allows you to modify puzzles or create them as gifts. Here are a few puzzles that use either my pix or public domain photos. -- Download this 104 piece shrimp polenta puzzle. Another yummy photo decadent shrimp foodies (like me) can enjoy, from pdphoto.org. -- Download the 221 piece Kung Pao Shrimp puzzle. I had also downloaded some of Jon Sullivan's (owner of PDPhoto.org) other pics, including Mexican food pics (food pics are relaxing!) and travel scenery photos, from which I made a few other puzzles for personal use. Click on the puppy names to download the specific puzzle. A 104 piece puzzle with two Anatolian Shepherd Dog puppies, Jasmine and her brother 'T' relaxing in the grass under an old picnic table. A 110 piece puzzle with my puppy Coco. This is one of my favorite puppy photos of this little monster her. First time I'd ever had a rough coat or a chocolate puppy in a litter. Lately she sometimes lines up with my walker and keeps along side. Maybe a service dog in the making. A 110 piece puzzle of gorgeous girl, Jasmine sunning herself on a warm wooden ramp. How-tos for enjoying your puzzle! First download to a location that you will remember. I made a folder called Puzzles and saved all of them into that folder. Once you have your puzzle(s) in your folder, then open your new folder and click on the name of one puzzle. To get started... maximize the window for the open puzzle. Note the crayons icon. Next to that are puzzle pieces. Use the puzzle pieces icon to change the size of puzzle pieces. Bigger pieces make the puzzle larger than many computer screens, so you can adjust to make it fit. The puzzle pieces icon can also alter shapes called FUN PIECES -adding cute cut outs of butterflies and kittens in the selection, try it by clicking directly on the arrows in the box. While playing, if you need the puzzle enlarged or shrunk, just click on the puzzle piece icon above and adjust! Another tip to help you get started - use the square outline of squares. That will put the flat sided edge pieces around the edges of the screen where you can see them more easily. The website for the game has free puzzles to play, and if you buy the program, there are free downloads to add to your gameplay. If you like professional, very high quality photos of different subject matter, there are collections that you can purchase to add to your game. For the collections go here and the freebies are at the bottom of the page. For more puzzles on this blog, click on 'puzzles' below. Below is Sandy according to this vid. No name given for this dog! 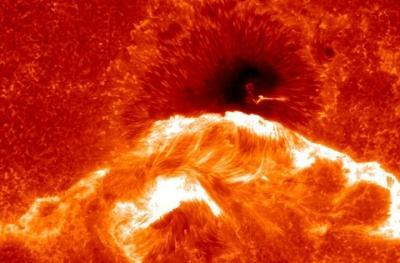 "Solar flares are essentially magnetic," Davis explains. In the maelstrom above a sunspot, lines of magnetic force are twisted and stretched until the tension reaches a certain point—and then the whole thing explodes. A rubber band provides a good analogy. Take one from your desk, hold one end in each hand: stretch and twist. If you twist, twist and twist to extremes, the tormented band will eventually snap, painfully releasing all the energy you just put into it. Flares happen all the time on the sun, but this one is amazing due to the technology that captures the force. Comes with a short video clip showing the twist and SNAP. Check it out! Yow indeed! Thanks for sharing. 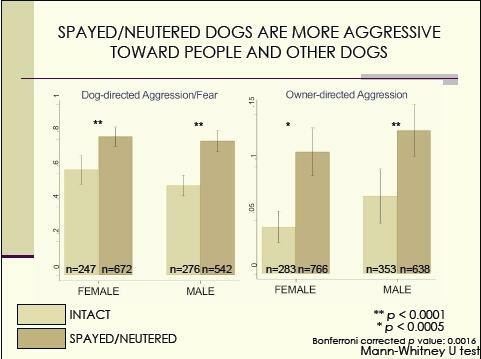 I've updated a php thread with captured images, including a better rendered version of above, from a few studies regarding dog health and behavior. 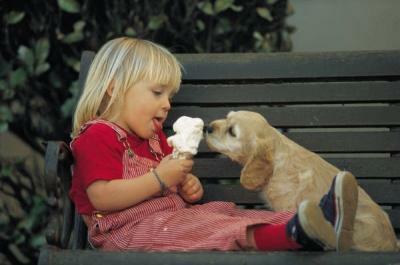 Above image is about the importance of hormones in the growing dog, its future health and soundness. Go here http://petoftheday.com/talk/ to see in better clarity and see the posting. If you have any particular interest in animal health, in dogs, working dogs, service dogs, genetic and environmental implications of dogs as I do, above link may be interesting reading. Canine Companions for Independence has addressed the question of pediatric spay and neuter in their programs. The results of theirs and of other studies, as well as potential implications thereof may prove to be very interesting to the general public. It presents a strong argument for encouraging pet owners (specifically) to examine the evidence regarding health and public safety in issues of surgical sterilization, pediatric spay and neutering, and of MSN from the current situation in L.A.
November of last year (2006), I had a blog post: dog-treat-recipes in which I mentioned a collection of recipes for those making homemade goodies for dogs (includes some recipes for cats as well). I figured I'd bump attention back to it, in light of the "Melamine for Pets" issues. People who are cooking for their own dogs might want to take advantage of this free collection of recipes. These are not my own originals. You'd have to see the original posting (above archive) to understand why I posted them in the first place. Nevertheless, I still have the recipes available for download but if anyone does find out if the original owner is still hosting the file somewhere and would prefer to keep it there exclusively, let me know. Here's just a few meal oriented (rather than treat oriented) recipes out of the collection of 300 or more recipes. The collection includes many treats, some weight booster concoctions for skinny dogs, one file on Hot Spots, raising a Service Dog, cooling pads, among other things, but it is primarily food oriented. After unzipping, it can be read as text, or can be incorporated into MasterCook as noted in my previous posting. Soak oats approximately 2 hours with enough water to cover; the amount of oats depends on the size and activity level of the dog. Add raw meat; again the amount of meat will depend on the dog. Add all ingredients; mix well. This recipe is to be daily 2x. It seems like alot of work but I prepare the food 2 weeks in advance using Ziploc bags. I used to be an avid commercial food user but I've been cured!! The dogs' all Rotties have nicer coats, smell better, no fleas, love their food and are not finicky eaters as before. It takes a little longer daily but well worth it! Brown lamb in a frypan. After it gets going, put on the chopped garlic to brown. Boil water, put about 4-5 cups into a crockpot, so it is already hot while you are fixing the rest of the ingredients. Add cubed potatoes to the frypan. Cut broccoli and add this to the crock. Put the rest of the works in the pot, add enough hot water to cover. Add pepper to taste. Throw in 1/2 cup brown rice and mix. In a large 24qt pot brown ground meat, add canola oil and garlic. When well cooked, add water. Bring to boil, then add veggies that have been processed, (frozen or canned veggies will work too). I use dried kidney beans and soak them the night before preparing a batch of food. While I am cooking the meat I have the beans in another pot cooking them. Once cooked, they are added to the above mixture. Next, the oatmeal is added. Frequent stirring is necessary at this point as the mixture will stick. Remove from heat, cool and put into containers. The above mixture feeds 3 Boxers for 1 week. I occasionally add pumpernickell bread and some times substitute brown rice for some of the oatmeal. This recipe is very flexible. I also add a mixture called Healthy powder to each meal. I feed twice daily and add 1 tsp of healthy powder to each meal for each dog. Oh, and speaking of ---- today ABC News featured Bone Appetit! Whenever I cook up a batch for my dogs, my humans get bent out of shape. What's wrong with peanut butter and jelly sandwiches anyway? I'll take mine with super crunchy and apricot-pineapple jam please. The Scientist : From water into wine into...dresses? The governments in the United States are supposed to exist for the governed, the people. That is why we are supposed to have elected representatives, elected by the people to represent their best interest. These representatives, Assembly Members, State Senators, Governor, U.S. Representatives, U.S. Senators, President are all supposed to be deciding things according to the will of the people. All that is necessary is to make that will known. Those who make their will seem to represent the majority will have their sway. They get their wish. 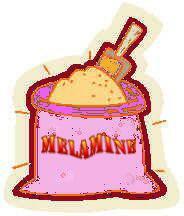 Melamine has been found in both wheat gluten and rice protein concentrate imported from China. Media reports from South Africa suggest a third pet food ingredient, corn gluten, used in that country also was contaminated with melamine. That tainted ingredient has not been found in the United States, the FDA said. . . .FDA investigators, meanwhile, are awaiting visas that would allow them to visit the Chinese plants where the vegetable protein ingredients were produced. 'Melamine was found in all three of those; it would certainly lend credibility to the theory that it may be intentional. That will be one of the theories we will pursue when we get into the plants in China,' Stephen Sundlof, the FDA's chief veterinarian, told reporters Thursday. Chinese authorities have told the FDA that the wheat gluten was an industrial product not meant for pet food, Sundlof said. Still, melamine can skew test results to make a product appear more protein-rich than it is, he said. That raises the possibility the contamination was deliberate. 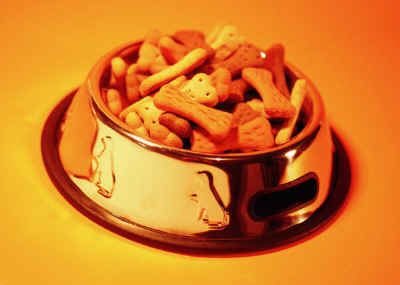 US Food and Drug Administration has a 'hot topics' page on the Pet Food Recall. These recent weeks have been difficult for those concerned about pet food. We want you to know that as pet lovers and owners ourselves, we have been equally upset by the current recall and the events that triggered it. Our hearts go out to those affected, and we vow to work tirelessly to continue our efforts to keep your pets safe and healthy. Today we are announcing the formation of the National Pet Food Commission, an industry government partnership composed of government officials, veterinarians, toxicologists and food scientists who are committed to maintaining and enhancing the high standards we have set in this country that protect our pets. 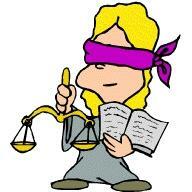 To investigate the cause of the current pet food recall. To recommend steps the industry and government should take to further build on safety and quality standards already in place. As federal investigators work to determine the exact cause of the adulteration, we are committed to our partnership, to applying the lessons learned to further strengthen industry procedures and safeguards, and to cooperating fully with any other official investigations relating to this incident. Melamine, the substance suspected of affecting animals, is not used in pet food manufacturing, and pet food makers have never seen it before. The substance is completely foreign to the process and quite simply should not have been present in wheat gluten. The total number of pets that have been affected after eating contaminated food remains to be determined, but we know that even if just one pet is affected, it's one too many. Very amusing pair of vids from YouTube! These remind me of four years ago when Boone and Ruya were pups. Boone (the boy puppy) was about 8 weeks old and was peacefully resting on a folded blanket in the grass outside. Ruya (the girl puppy), only a month older but much larger, came up to the blanket and grabbed a corner of the blanket in her teeth. She started tugging, backing up and trying to drag the blanket around to a new spot in the yard while Boone rode with jerks and starts. It was so funny! Boone sat up on the blanket, his body jerking with each tug and his head bobbling like a toy - just sitting there and watching Ruya do all the work. Of course, no camera to catch it all! Babe, the cat, lays in the Rudy's bed! Rudy is desperately trying to find a way to get the cat out of it! Doggy (Rudy) trying to open his Christmas present! A surprise hides in the box! I had no idea she was into mycology! I've seen some of her beautiful paintings for years and I merely thought, well she certainly likes to paint flowers, plants and rabbits! Her interest in fungi is a fascinating dimension of her, particularly because of how self-motivated and enthusiastic she was in her study of them, despite a lack of scientific background. Apparently in her time, she just wasn't taken very seriously. Fascinating story on her at The Scientist. Roy Watling, of the British Mycological Society, says Mary Noble, one of his former colleagues, stumbled upon Potter's drawings close to 15 years ago while sorting through bags filled with Potter's work. "Until then nobody knew about her work with spores," he says. 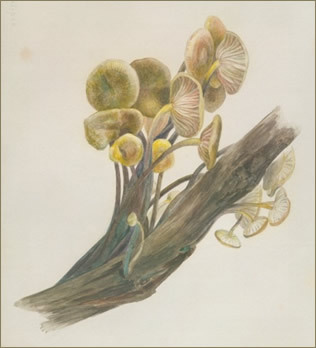 Potter's illustrations captured details about fungi that had eluded other scientists at the time. For example, Potter drew the first record of the fungus Tremella simplex in Britain. She painted the fruiting bodies, the basidiospores, and all other parts at all ages in the fungus life cycle. "She drew everything she saw," says Watling. From StorageMojo » Google’s Disk Failure Experience, the subjects of hard drive wear from heat, age, workload, hard drive specs, and software monitoring of your drive are covered. It is a review of Google's report on "Failure Trends in a Large Disk Drive Population". Yer just paranoid, Semavi Lady! Hdd's are good for paperweights! Above, a chart showing California shelter statistics trending since the 1970's. Above is some data from a ten year trend in the State. To learn more about these stats, the reference link of The Animal Council http://www.theanimalcouncil.com is one place where many fact sheets are available. Take time to analyze the material and reports regarding the track record of implemented mandatory spay/neuter laws. Analysis of data isn't popular, not even to those who have opportunity to act on public policy. But many would prefer to support policy that has "reasonable prospects of success". "As a corollary to the report by Animal Law Coalition that Los Angeles County recently passed such a mandatory spay/neuter ordinance, the following examines to what extent such laws are effective in reducing numbers of animals in shelters and euthanasia rates of dogs and cats." ...go read the rest at the link above. The Animal Council has numerous files and data at their publications link. And if you're a fan of logic and CSI type shows, you probably have a pretty good idea how one can use data to scope out the size of the issue, determine where potential problems might be, and also begin to appreciate where the red herrings might be. It's common to look at a chart, jump to conclusions. We all do that sometimes, especially if something includes data in an area with which we are not familiar. There are many people supporting CA AB 1634 that claim to have read it. Apparently, they read and understood it with the same vague appreciation, familiarity and comprehension that people might have for E = mc2. They know that it makes sense at some level, that the principles apply but they haven't really walked through the game plan from perspectives that need to be applied to see how the equation will apply in different circumstances. Read some of the other ones. If you have not "Walked the Walk" - yet you are in the position of determining policy for others, be aware that there will be "unforseen" repercussions if the strategy is not carefully evaluated. Many rare breeds and working breeds are not registered with organizations that promote the SPORT of conformation showing and other variations of sport. Forcing the pet owner who normally controls their pet to become part of a competitive SPORT or a specific registry just because their is animal entire (not neutered), is prejudicial and is an illogical basis of determining or forcing responsible ownership. Some things we do know about MSN is that it has reversed progress toward 'no kill' (defined as downward trends in euthanasia rates, making them go upward instead) and when accompanied with licensing of fees with a great differential between neutered and entire animals, there is a plummet in the number of licensing fees that are paid. Reasonable fees would otherwise have helped in Animal Control - higher fees guarantee that fewer animals will be licensed. Additionally, limit laws are often instituted to reduce the number of pets people can have. As if there is a 'best' number that the government can determine for everyone. What happens is that people who would have helped to rescue or foster, now cannot do so. This also results in plummeting income from licensing fees since people would rather keep their animals than get a visit from an authority that one or more of their critters MUST GO. An older couple who has four cats and five chihuahuas suddenly gets faced with the fact that under the new policy intended to control unwanted animals in shelters, they are only allowed five animals. Some of their pets may be in their teens. At $75 per pet, this may be beyond their means. So the rhetorical question is, which pets should they kill so they can be compliant? They can't do it, so they keep their pets, go underground and stop paying licensing fees. Gah, stupid law breakers, eh? There are people who live on 25c boxes of macaroni and who have a kitten or puppy walk into their life somehow. They feed and care for it and keep it from becoming a road statistic. They do not have money for vet visit, vaccination, and neutering but in time they can save enough money to do so. I've known many people who lost everything in their lives and a pet kept them going until they were back on their feet. Do you realize that if someone in their hood wants to rat on them, once 'caught' if the pet owner can't pay $500 to the state for penalties ------ will that baby animal end up in the euth bin at Animal Control? Public policy needs to be fair and not just favor the rich, the able bodied or favor special interests who have lost sight of the silent majority. Animals turning up in shelters are often those belonging to people who function 'under the radar' if they are not strays. Those are the ones owned by people who are not following the current laws anyway and the pet may not even be vaccinated at all. The new laws intend to track the rest of us. The animals under the radar will still be there! 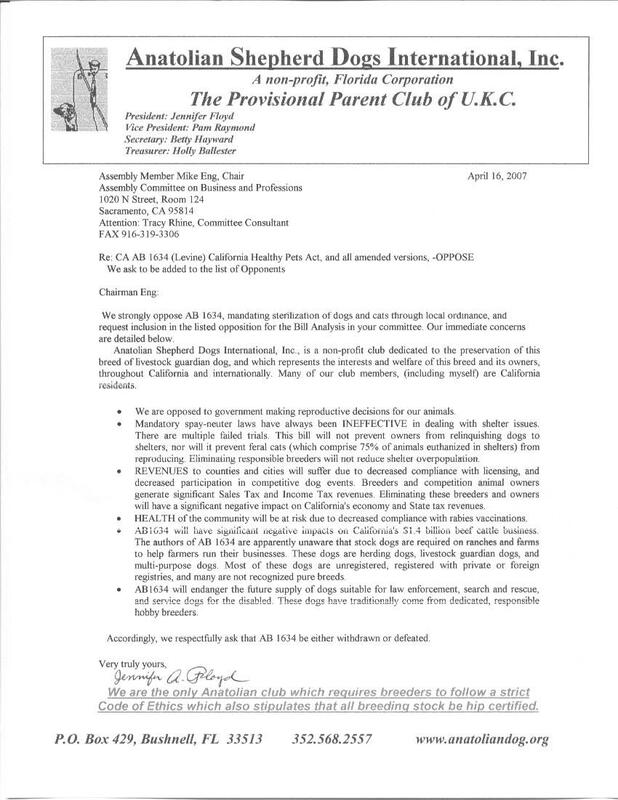 Here's more in the way of a roundup, a summary I copied from California Federation of Dog Clubs at http://www.cfodconline.org/legislation.html. To see it at the link, scroll down under the map of the USA. • The ordinance requires spay/neuter of all dogs and cats in the unincorporated parts of the county unless the owner obtains an unaltered license or breeder’s permit. Chap. 8.02.090, Sec. 3332.4 (a) If an unaltered animal breeds accidentally, the owner must obtain a breeder’s permit. The license fee for unaltered animals is nearly twice that of spay/neutered cats and dogs. Any owner redeeming impounded unaltered animals must pay an additional fee. This fee is refunded if the animal is spayed or neutered within 30 days. Any unaltered animal impounded twice or more within a 3-year period will be altered at the guardian’s expense prior to redemption. Chap. 8.02, Sec. 3330.8 Penalties for violation include fines of up to $100 on the first offense, $200 on the second offense, and $500 for each additional violation of the same ordinance within one year. • After the effective date of the ordinance, dog deaths in the areas governed by the ordinance, increased 126% and cats 86% while licenses declined by 35%. For the county as a whole dog deaths decreased 5% and cats 16% in 1993; in 1994 dog deaths declined 12% and cats 17%. From 1991-1994 there were no cat breeder permits and 50 permits for dog breeders, eight of which were renewals. In addition, licenses dropped dramatically. For 1998-99, the number dropped to 36,023, a dramatic decline from the 48,000-51,000 range of the previous two decades. • Requires the spay/neuter of all dogs and cats unless the owner has obtained a $100 annual unaltered animal or breeder’s permit. Sec. 53.15.2 For any dogs that breed, the owner must obtain a $100 annual breeder’s permit for each animal which allows 1 litter. A second litter during the annual permit period may be permissible “to protect the health of the animal[,] avert a substantial economic loss to the permittee” or "if the first litter was euthanized". A breeder must register all dogs bred for sale and disclose their name and permit number in any ad and on any sale documents. The city also tracks the identity of subsequent owners of the animals sold by breeders. There is a $91.50 license fee for unaltered dogs and a $6.50 charge for animals that have been spayed/neutered. Sec. 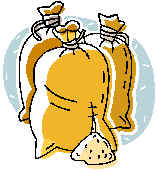 53.15.3 Violators are subject to fines of up to $500.00. • Since the passage of this 2000 “spay or pay” Los Angeles ordinance, there has been a decline in dog licensing compliance. The animal control budget after passage of the law rose 269%., from $6.7 million to $18 million. The city hired additional animal control officers and bought new trucks and equipment just to enforce the new law. • Requires spay/neuter of dogs with limited exceptions for breeding. Secs. 6.10.030, .050 The city requires a $15 certificate and charges twice the amount for a license for unaltered dogs. Dogs without the certificate must be spayed/neutered. There is a warning for a first offense, and a mandatory spay/neuter order is issued for a second violation. • Since the law’s 1991 inception, licensing compliance has dropped significantly. • When the law was enacted, it was estimated that 550 breeding permits would be issued per year. In reality only an average of 30 permits were issued per year. There was an estimated 50% decline in licensing compliance. • Licensing compliance fell off after passage of the ordinance. As a result there was a reduction in rabies vaccinations which lead to an increase in rabies in the city. • Mandatory spay/neuter ordinance required a $500 permit fee to possess an intact dog or cat. In 2000 it was changed to $10, because of there were so few requests for it. But then again in 2001 the permit fee was again raised to $100, its current rate. 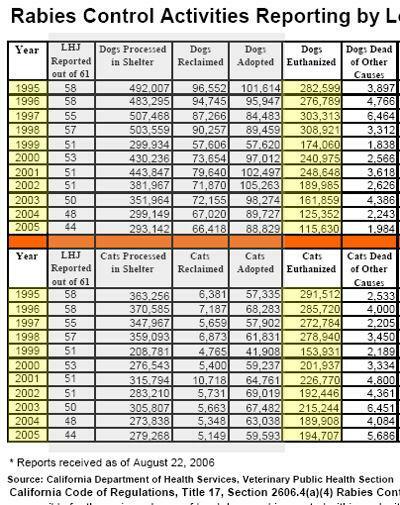 As for the euthanasia rates since the effective date of the ordinance, the PAWS NJ website comments, “An analysis of these statistics shows the Humane Society of Southern NJ which operates the Camden County Animal Shelter, to be consistently one of the leading, if not the leading killers of animals in the state of New Jersey.” The report covers 1998-2001, well after the effective date of the mandatory spay neuter ordinance. The site’s report on the top 50 New Jersey animal shelters reveals some in Camden County have significantly lower euthanasia rates than others in the state, but at least 2 had the highest kill rates in New Jersey. • License compliance has appeared to decrease since passage of the ordinance. Animal control expenses have increased 56.8% and revenues only 43.2%. In 1990 the total cost of animal control was $1,662,776; in 1997, it was $3,087,350. Euthanasia rates actually fell at a slower rate after passage of the ordinance. 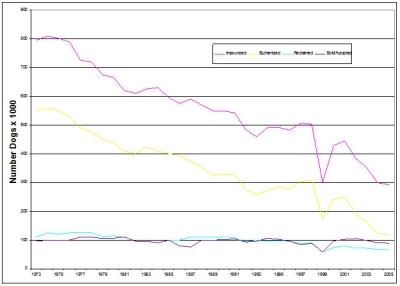 In the years prior to enactment of the law, euthanasia rates were plummeting in King County. The data shows that the one real success as a result of the ordinance was the increase in adoptions. • Requires breeder permits as part of its mandatory spay/neuter ordinance, licensing compliance has dropped dramatically. Secs. 14-42; 14-71(b), 14-101(a)(1). Pinellas County Florida has required breeder licensing since 1992. Sec. 14-29. • Since then the animal control budget has increased 75% with revenue increasing only 13%. There have also been increases in shelter intake and euthanasia rates since the law took effect. We can approximate with the available data, that possibly over 95% of all pets in California are never showing up in a shelter. A significant number, possibly 80%, of the pets regularly seen by vets ARE reportedly already neutered (according to some reporting vets). The 4% that do turn up in shelters result in 2% of California pet animals that are killed. 1 or 2% of which are likely to be feral cats and less than 1% actually being adoptable purebred dogs turn up in a shelter. Look at the data and study it analytically to find the best solutions. There are so many dynamics to consider when attempting to create public policy that is fair and effective. Policy that will encourage people to help rescue without penalizing them for being over quota. Policy that will allow them to afford the licensing on the animals they do have. of different things that can help people form their own opinions. sometimes it's hard to find something you need later.